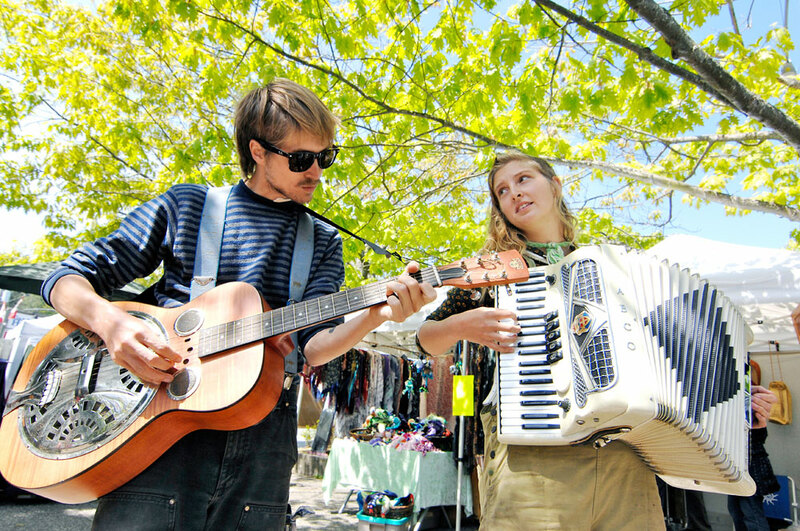 Buskers entertain at the Salt Spring market. 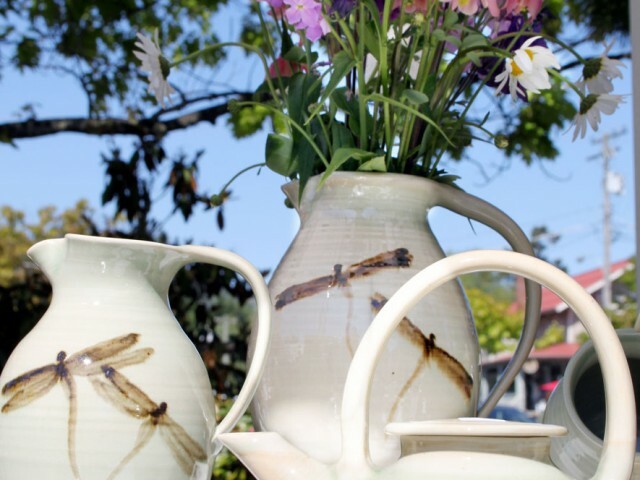 A potter's wares on display at the Market in the Park. 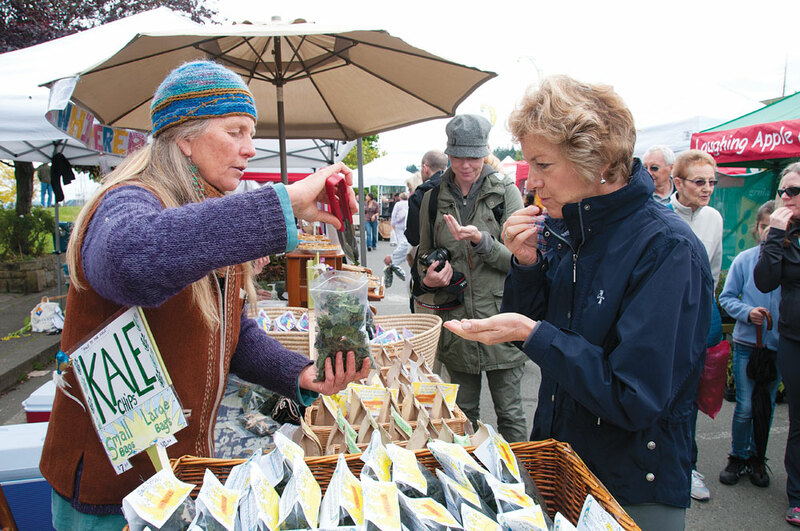 A visitor samples kale chips in the Saturday market on Salt Spring. 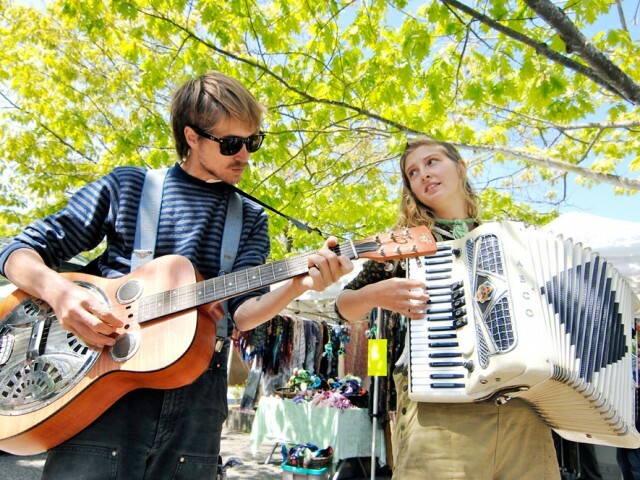 Salt Spring’s Saturday Market in the Park is a kind of legendary shopping experience akin to Chiang Mai’s night bazaar or a Moroccan souk, but with one major difference: everything sold there is created on the island by local artisans or food producers. With an average of 150 participants setting up in the early hours each week, the market offers a range of goods no less plentiful than the most exotic trading crossroads. 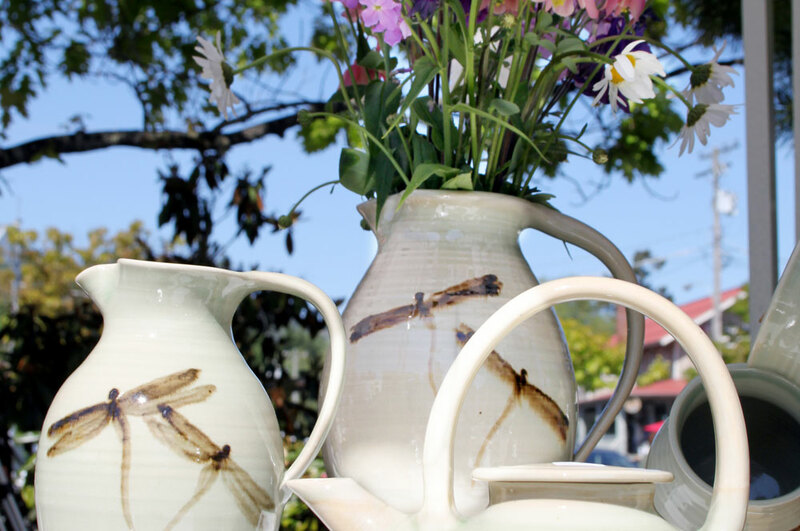 Art, jewellery, hand crafts, body products and soap, clothing, musical instruments and cards are among the souvenirs that visitors take away with them. 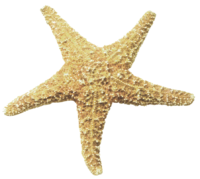 Gifts to brighten a short stay include fresh produce, cut flowers, smoked salmon, cheese, baked goods and bread. Munchies to enjoy on the spot speak to every palate, from thick breakfast burritos to refreshing popsicles made with fruit juice or yogurt. 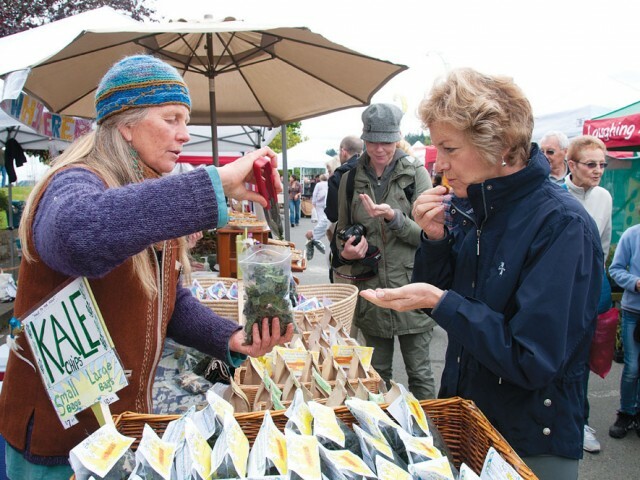 One long-time vendor is jeweller Terry Warbey, whose handcrafted silver work depicts iconic west coast symbols such as orcas and sand dollars. Like so many market sellers, Warbey says the personal interaction with the public is the best part of his Saturday. 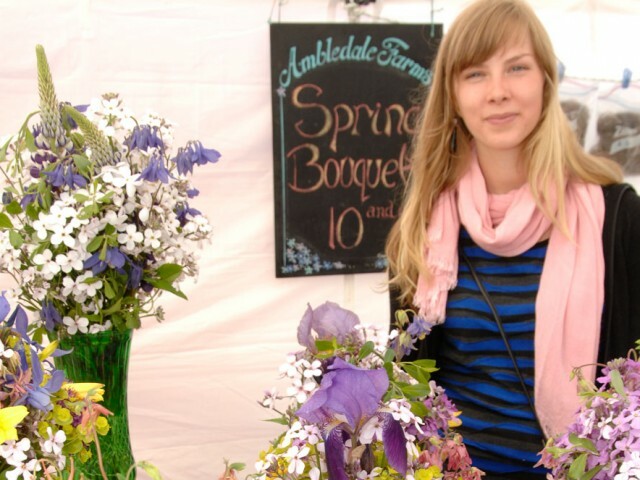 Andrea LeBorgne of Monsoon Coast Spices is in her eighth season as a marketeer and loves to watch the ebb and flow of vendors, locals and visitors, and the energy new vendors bring each year. 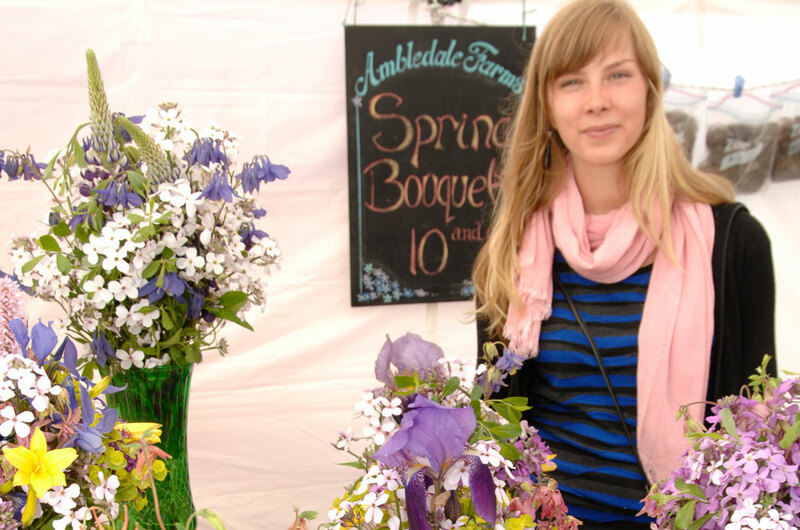 In 2016, the Market in the Park is open every Saturday from March 26 to Oct. 29. Hours are approximately 8:30 a.m. to 4 p.m.
No dogs are allowed in the market, but a “doggy daycare” service is operated by the local BC SPCA branch during summer months from 9 a.m. to 3 p.m.